Free Shipping Included! SunwayFoto YLS-02B Dual-Dovetail Grooves Y-Type Lens Support by SUNWAYFOTO at EISF. MPN: YLS-02B. Hurry! Limited time offer. Offer valid only while supplies last. SUNWAYFOTO® brand Arca compatible. Arca type Dovetail for clamp. Width: 39mm. Length: 111mm. Lens support width: 73mm. Groove length: 85mm. 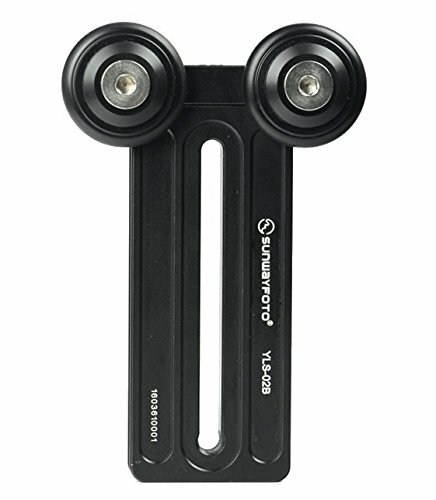 SUNWAYFOTO® brand Arca compatible. Arca type Dovetail for clamp. Width: 39mm. Length: 111mm. Lens support width: 73mm. Groove length: 85mm. Thickness: 22mm. Weight: 116g. Includes 1/4" mounting screw. If you have any questions about this product by SUNWAYFOTO, contact us by completing and submitting the form below. If you are looking for a specif part number, please include it with your message.